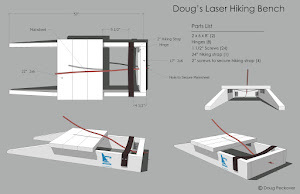 Brett has been assessing the new Laser Mark II sail in Sydney. Here are his comments. There is no leech flutter at all – so that will be an improvement. The tapered battens conform to the natural sail shape better – so that will be an improvement. There is less lower leech hooking – so that will produce less weather helm. The mid to upper leech really stands upright, even with firm downhaul. This I feel will produce the biggest (potential) difference. Bigger/stronger guys can enjoy better/more consistent sail shape for longer up the wind range before depowering. The use of downhaul now doesn’t need to be excessive as this is not an effective depowering device, like on the old cut sail. The depowering will now be more reliant on vang and outhaul – more like the Radial sail. You can produce a flat/depowered sail and still have nice consistent sail shape. ie no mismatch of shape. 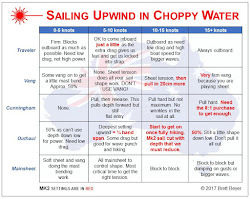 There is not the amount of knuckling on the luff when some downhaul is pulled on. Seems the sail is cut with less luff round down low. The top tapered batten produces rounder shape up the head which will be more power for lighter winds/bumpy water. There is still some diagonal wrinkles from mast join to clew but not as bad/deep. 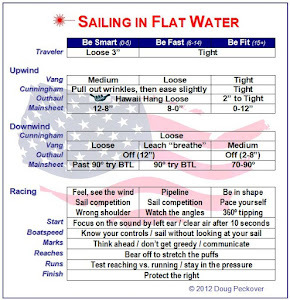 I’d like to see a top class sailor use the sail in over 15 knots to see how the leech responds. The old sail just stretched and with excessive downhaul did twist off the leech a little. I’m not sure that will or can happen with the new sail, hence the reliance of vang over downhaul. So, I think the sail will be an improvement in most wind and chop conditions. Because of the very firm and upright leech, I’m not sure how it will go in 5 knots and bumpy water and then in 15 knots or more. There will be some re-learning I suspect of how to get the rig to be slightly more ‘elastic’ in bumpy water, i.e. more leech movements. Given all that you have learned, do you plan to use the new sail at the next worlds? I am convinced the sail will be better in light to medium breezes and flatter water. I'll wait to see a top sailor use it in a breeze to see how the leech opens up. I suspect it won't and therefore you have to rely on excessive vang like the Radial, but that is just a slight variation. So that only leaves light wind and bumpy water where I think the new sail will be a disadvantage. I will use the new sail in Mexico as I think it will hold its shape up the wind range and therefore suit bigger guys like me. We have just concluded the NSW States Titles over the weekend with around 50 Standard Rigs. Probably 10 were using the new cut sail. It seems to have a slight downwind advantage as well. Not necessarily in raw boatspeed but the firm leeches make getting the exact vang tension more forgiving and more accurate over a broader wind range. The new sail does produce more weather helm and over-sheeting is more of a risk in the lighter winds. But to me, these slight variations are not enough of a disadvantage/risk to not use the new cut sail. We don’t have access to rolled sails in Australia so the choice of rolled vs. folded is made for us. It is early days but I suspect the break in period will not be as long or as critical as the original cut sail. Better and stronger cloth with better shape means the sail is fine straight out of the bag. 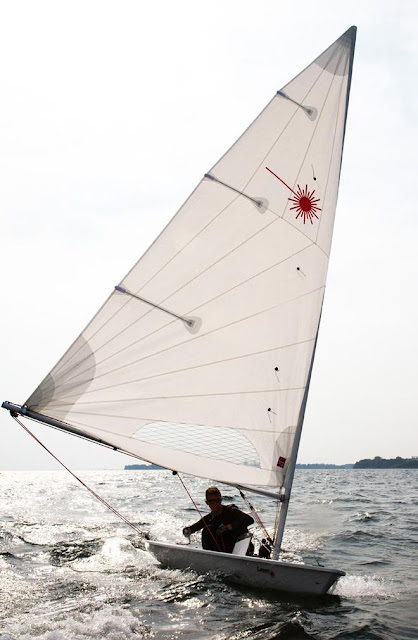 It will be interesting to see how many sailors at the Masters Worlds use the new sail. I expect there will still be a fair number using the old one? If so, this could be the best (and biggest) opportunity to really see how the two perform against each other in a major regatta, especially as the class has said the new sail will not be used in any Olympic qualifying events, which I guess rules out many of the open (non masters) regattas in the next few months. And I see the new sail is explicitly forbidden in the NOR for the Standard Laser Worlds in Mexico. Big waves are enough to put one's life at end. So it's our duty of shipping department to make sure that the weather is safe for sailing.So we use Weather Measuring Instruments for safety by forecasting information about weather, wind,wind speed,temperature and about so on. Welcome back. I've used the MK II a few times and have found it very similar except that it's harder to tighten the downhaul because the cloth is so much stiffer. I really like how the new sail holds its shape at the top. And I'm now convinced that it points higher in most conditions.